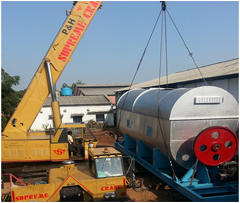 We have in store a wide range of Ddgs dryer (Dry distillers grain soluble dryers). Ddgs dryers are precisely designed by a team of experts. Moreover they employ a latest technology and machinery for manufacturing the products as per the client's requirement. Ddgs is obtained as a bi product from a grain distillery. Slops from distillation column are concentrated in multiple effect evaporators and the concentrated slope is added on the decanted residue obtained from the fermentation process, which are mainly proteins and the fibrous material of the grain. This mixture of the concentrated slope and the residue is dried in Ddgs dryer indirectly heated rotary dryer or stream tube dryer to obtain Ddgs which is used as cattle feed and the distillery truly becomes zero discharge. Ddgs dryers are designed by considering the wet and dry product flow characteristics, lump crust formation and thermal sensitivity of the material in dry condition. It has features of high productivity, stable work, reliable, safety, convenient loading and easy. Universal are bringing these Ddgs dryers to our clients at a very exclusive range of prices. © Universal Engineers 2012. All Rights Reserved.